Many different desserts can be made from the Carte d’Or Pannacotta Dessert Mix. This cheese cake recipe is just one of them. Super easy to make and doesn’t require any cooking or fuss. Cut it into heart shapes. Place the biscuits into a food processor, blend so they resemble coarse crumbs, add melted butter and combine well. Place the biscuit mix into a large tray and press flat. Place into the fridge. Bring milk to the boil, remove from heat and add the CARTE D'OR Pannacotta Dessert Mix and cream cheese, mix well until smooth. Pour into the tray on top of the biscuit base and place into the fridge to set. 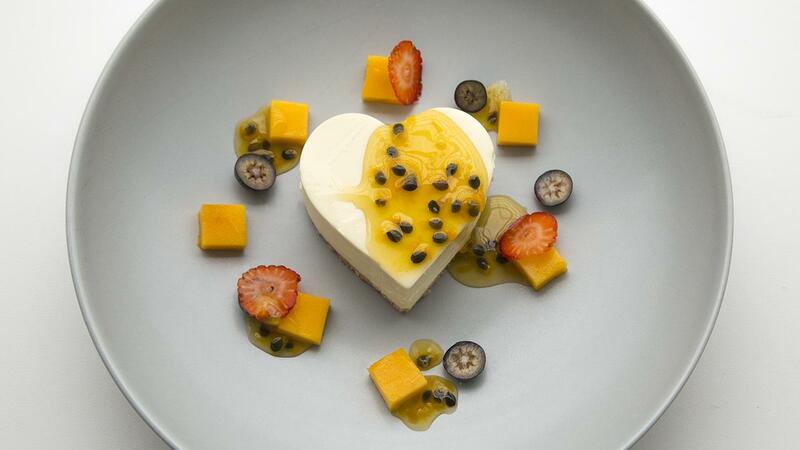 Cut the cheesecake into heart shapes and pour over passionfruit pulp. Serve with mango, strawberries and blueberries.